The bankruptcy code enumerates several items that need to be provided in terms of bankruptcy filing. These include, but are not limited to, credit counseling, production of tax returns, production of pay advices and other items that may be requested by the panel trustee or Chapter 13 trustee. If your bankruptcy attorney is requiring that all of the items be provided prior to filing, then you are receiving some misinformation about what is actually required to file for bankruptcy. The only absolute requirement which must be satisfied before a bankruptcy case can be filed under either Chapter 7 or Chapter 13 of the bankruptcy code is the completion of a credit counseling session approved by the office of the United States Trustee. Without the credit counseling completion, the actual filing is void. Thus, a bankruptcy attorney cannot actually file an official bankruptcy case without the credit counseling requirement being satisfied. Additionally, the credit counseling session, which provides a certificate of completion, must be completed within 180 days of filing. I have had clients who took the credit counseling and then dithered with regard to the actual filing. Some of these clients had to take a second credit counseling session because their first certificate had expired at the time they were actually ready to file. Is The Case An Emergency Filing? One of the things that I do in my office is to ascertain whether or not the filing is an emergency or not. 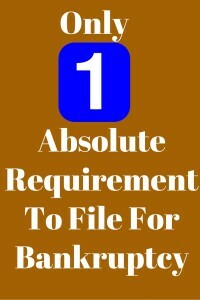 If I have an emergency filing situation, I am going to soften the requirements necessary to file. I am not going to require the taxes or all of the paycheck stubs if the debtor is in need of an emergency filing. However, I must receive the credit counseling since I do not have the ability to waive this item in the Northern District of Illinois. However, if I have the credit counseling, I can let the debtor provide the additional documents later. This is done with the caveat that if the items are not provided in a timely fashion, the case will likely dismiss on motion of the Chapter 7 or Chapter 13 trustee. If this were to occur, the debtor would not be provided the bankruptcy protection and a case would have to be refiled. When looking at refiling for Chapter 13, the debtor needs to be aware of a motion to extend the automatic stay in the case of a refiling within one year after dismissal or a motion to impose the stay in the case of a refiling where two cases were dismissed within the year. As you can probably ascertain, it is much better if the debtor has everything required prior to filing. This would mean completing the credit counseling, providing the proper pay advices and providing the proper tax returns. However, when the debtor does not have that luxury, a good attorney can make an exception to help the debtor. For example, if there is a sale date approaching, and the debtor has not filed all of his Federal returns, a case can still be filed. The debtor must understand however, that the returns must be completed and filed in a timely fashion or the case will be dismissed. The same is true with the debtor being garnished. If the debtor’s employer is going to cut checks on Thursday, then the case needs to be filed prior to Thursday to stop the garnishment. If the debtor does not have all 60 days’ worth of paycheck stubs prior to filing, but can acquire them in good order, then I am okay to file to stop that garnishment. Remember, once garnishment funds are deducted from a debtor’s paycheck, those funds rightfully belong to the creditor. Thus, in a sale date situation, a garnishment situation, and an auto in danger repossession situation, the attorney’s office should do whatever it can to assist the debtor in the filing of the bankruptcy case. In summary, the only requirement that absolutely has to be completed before filing is the credit counseling. If your attorney is forcing you to comply with other requirements which could be done subsequent to the filing, then that attorney is doing you a disservice. For more information about filing for bankruptcy, you can contact my office at 847-520-8100. I will get you out of debt and I will get you turned around.